In a new article titled The “Underwater Pyramid” Discovered off the Azores—The Update No One Wants To Read, Dr. Greg Little reminds us that not all “discoveries” are real and that not all “scientific evidence” is credible. And this is especially true when it comes to underwater sites, where depth or surface conditions make a physical investigation impossible. I’m one of the first to jump on a new finding and shout, “See! We told you so!” but the Azores Pyramid is a case where the claims really were too good to be true and Dr. Little was one of the first to advise caution – and it turns out he was right on. A new article by Dr. Greg. Little which challenges the traditional thinking of Ufologists. Listen to Dr. Greg Little describe the amazing findings made by him ad his wife, Dr. Lora Little, in the Bahamas! This interview was conducted by William Henry and is currently available on Whitley Strieber’s excellent and informational website, www.UnknownCountry.com. I just received the link to Dr. Greg Little’s latest blog entry and in it he provides an overview of the presentation his wife, Dr. Lora Little, made at an ARE conference at Montgomery Bell State Park near Nashville, TN. Dr. Lora released the latest findings regarding a submerged megalithic structure near Bimini called Brown’s Ruins. There is now indisputable physical evidence that a large structure – or structures – once existed about 30 miles south of Bimini at the edge of the Great Bahama Bank and near the deeper Gulf Stream. The ruins consist of a “massive mound of rectangular stone blocks, cubic blocks, long beams, smaller building blocks, triangular blocks, huge flat slabs, round columns, fluted columns, and a host of broken blocks of various sizes and shapes.” It is thought that the raw materials for the original structure either came from quarries in Jamaica or Cuba although there’s no historical evidence of this type of material being removed from quarries on Jamaica. Read all about the Little’s discoveries and their possible discovery of the famed “Temple of the Poseidians” by clicking HERE. Archaeology has finally come into the 21st century (no pun intended) thanks to Google Earth and other satellite imaging resources. A small group of dedicated folks have been taking advantage of high resolution satellite images for several years, and Angela Micol has now brought this promising technology to social networking! I first encountered Angel’s work on one of her earlier websites, Satellite Discoveries. That site has been transformed into Google Earth Anomalies and now Angela is also sharing her ideas and discoveries on Facebook through a private Group. You’ll have to request permission to join and behave yourself while you’re there but the images being shared by Angela and other members are of the group are very interesting. I can’t share any of those images here because the information is “private” so you’ll just have to go see for yourself. Visit Angela’s Facebook group at http://www.facebook.com/groups/satellitearchaeology/ and tell her The Mega Blog sent you! On his blog, Dr. Greg Little has posted a lengthy article outlining some of this year’s findings. Among the topics discussed are crashed airplanes (at least 331 of them! ), the Marble Ruins (actually the result of a 19th century ship wreck), the pre-ice-age Underwater Foundation (circa 19,000 B.C.) and The Rectangles (50 square & rectangular formations in 100 feet of water). Dr. Little also states that one [significant] discovery has been intentionally omitted from the report and that information will be available by Dr. Lora Little at A.R.E.’s October, 2012 Fall Retreat. 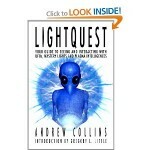 In other news, I’m currently reading Andrew Collins’ latest book, Lightquest, an interesting take on UFOs, light beings and other-wordly phenomenon. Collins examines numerous incidents and presents a compelling case for beings I will call “the Teachers” in my next novel. Dr. Greg Little, Alternate Perceptions Magazine Issue 174, July 2012. After a long dry spell of nearly a year, we’re back with some recent news about the ongoing research in the Bahamas. Dr. Greg Little recently posted an Expedition Report from a 5-day survey of the Great Bahama Bank he and his wife, Dr. Lora Little, made in August, 2011. In addition to the narrative, this report includes two short video clips, two underwater photographs and several hyperlinks to previously published articles on the area. In his article (http://mysterious-america.net/final2010atlanti.html) Little describes three distinct areas of interest: the Rectangles Area, Pino Turolla’s Columns and an unnamed area 10 miles south of Bimini that contains granite slabs, stone steps and cut rooms. Each is uniquely interesting and together they seem to provide the “smoking gun” that proves the existence of an ancient maritime culture which flourished in the area more than 10,000 years ago – long before the Egyptian pyramids rose above of the desert sands in the Middle East. The Rectangle Area: This area has been “under suspicion” for some time and was first identified by William M. (Bill) Donato using side-scan sonar back in 2006. According to Little, who has conducted several on-site explorations, the site includes about “50 square and rectangular formations ranging in sizes from 10 to 45-feet or so. They have a striking appearance because they are regular in shape (most are square or rectangular), areas of white sand are spaced between them, and they are arranged into three parallel rows on a straight line running for about 1.5 miles. Most of them have outer walls, many vertical, that are from 2 to 6-feet high.” The Rectangle Area is a flat, sandy area some 4 to 5 miles off West Bimini and 100 to 110 feet below the surface. The area is adjacent to an ancient shoreline that experts believe slipped below the surface of the rising ocean more than 12,000 years ago! Pino Turolla’s Columns: This area off South Bimini was uncovered by the storms of 2010 an is definitely a submerged structure. In his article, Dr. Little suggests that this site was probably first reported by Count Pino Turolla in the 1970s but that the ever shifting sands in the area covered it up until just recently. Little’s recent visit to the site revealed the presence of at least three long stone beams, each between 20 and 25 feet in length and arranged perfectly parallel to each other. Additional investigations have shown that these “outer beams” are quite probably the outer stonewalls of a building. “It was a rectangular structure, 45-feet in length and 30 feet wide. It was divided into two rooms with one about twice the size of the other. Examination of the walls shows that they extend down at least 4-feet into sand and more sand conceals the actual extent of the vertical outer walls. All who have seen the structure agree that it is the ruins of a building,” relates Little. This structure was probably in use about the same time as the “Bimini Road” feature – some 5,000 years ago. Granite Slabs, Stone Steps and Cut Rooms: Some 10 miles south of lies an area containing numerous flat granite slabs arranged in what appear to be rooms. A multilayed stone wall runs along the back of the “rooms” and stone steps lead down into a cut passageway. These features are in about 20 feet of water. Nearby there is another stone formation that appears to be very similar to the Bimini Road formation. Coincidence or Evidence? Skeptics might try to brush off any one of these locations as “simple beach rock” but three such outstanding locations in such close proximity to each other seem to provide undeniable proof that a sophisticated culture inhabited the “new” world much earlier than originally thought. Dr. Greg Little, in a new article posted here at Alternate Perceptions Magazine, has released some stunning photos of the undersea rectangles that he believes may be the foundations of ancient stone buildings. There are apparently about 50 individual structures, each measuring approximately 10 x 45 feet in size and resting on the ocean floor 100 feet below the surface. According to Little, this puts them on the 10,000 B.C. shoreline and would imply that the maritime culture who laid them out in straight, parallel rows is more than twice as old as the culture that built the pyramids in Egypt! Dr. Little’s latest article is loaded with big news for those who have been following the Bimini research but, for me, the most exciting part is the section titled “First Definitive Underwater Stone Building Ruins Found?” You see, in the spring of 2006 I released the third and final novel in my Seeds of Civilization series. Like the previous two installments, Triangle is loosely based on real underwater archaeology and it even includes scenes set in the “Lost City of Cuba.” However, the climax takes place off the southern coast of South Bimini and four years ago I wrote about an “unusual structure” in almost exactly the same spot where the Littles’ most recent expedition has just discovered never before explored stone ruins! Once again, fact meets fiction! Check out my series at http://www.SeedsOfCivilization.com or pick up a copy of Triangle by R.J. Archer anywhere books are sold. ISBN-10: 0977910938, ISBN-13: 978-0977910939.